As most days, we left our overnight stop (Augrabies National Park) at first light, which is about 7 am in the winter months here in South Africa. We had a long way to travel today, over 500 km (300 miles) part way, on terrain we weren’t 100% sure of what to expect. We were heading for our first destination in the famous arid and beautiful Kgalagadi Transfrontier Park, where we would be spending the first 3 nights at the remote ‘Kalahari Tented Camp’. So we set off en route for the Kgalagadi Transfrontier Park, as the sun rose it painted a glowing pale orange and yellow wash on the ‘quiver trees’ which lined our route out through the main gate of Augrabies. We had decided to forgo breakfast before we set off, in favour of stopping at Vergelegen Guesthouse the little gem we found the previous day near Kakamas, which was only about 40 minutes drive away. After having bottomless coffee and a ‘farmhouse’ breakfast, muesli and toast, we had another quick wander around the pond attached to Vergelegen to see if we could see anything different from yesterday and to take a few photographs in the morning light. We then set off for Upington. Passing through Upington and turning northwards towards ‘Twee Rivieren’ and ‘check in’ at the southern entrance to the Kgalagadi Transfrontier Park we were making good time. As we drove the 250 km from Upington to Twee Rivieren the wide flat open spaces were left behind us and the rolling red sand dunes so indicative of this desert area here became more prominent and it felt as though you were on a roller coaster ride over the dunes. More and more large Sociable Weaver’s (Philetairus socius) nests (these nests are perhaps the most spectacular structure built by any bird) became evident as we were approaching the epicenter of their range in the Northern Cape and Southern Pale Chanting Goshawks (Melierax canorus) seem to be on every other telephone pole or fence post we drove past. We finally arrived at the Kgalagadi Transfrontier Park and the ‘Twee Rivieren’ rest camp check in, South African side or the ‘Two Rivers’ check in and border post if you were to go to the Botswana side, both are the Southern gateways to the park. It was about 1pm after we had checked in and received our ‘entry permit’ (which is a very important piece of paper, more about that later) just time for a picnic lunch at the Twee Rivieren camp site (first sighting of a yellow mongoose here) and deflate our tyres as we were to be driving on soft sand during our stay. We were advised at reception it would take another 3.5 hrs minimum drive to our destination the ‘Kalahari Tented Camp’ which was only 120 km (75 miles) away and we had to be there by 6pm before Rangers would be looking for us, plenty of time? Mmmmmmmmmmmm. 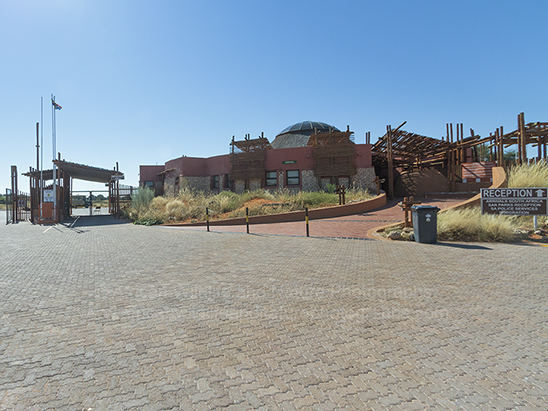 We finally drove through the main gate to the Kgalagadi Transfrontier Park proper at about 1.30 pm and we felt like we were really on our way, binoculars accessible, check, cameras accessible, check. We had been driving for about 30 minutes trying to get used to our new surroundings and the vastness of this ‘arid’ park and I said to my wife ..”well the road isn’t that bad to drive, gravel, stoney and a little ‘rutty’”.. opp’s I spoke to soon. (For those who don’t know, the Kgalagadi Transfrontier Park is largely based around 2 ‘dry’ riverbeds the ‘Auob’ and the ‘Nossob’. These types of rivers are known as ‘ephemeral’ rivers which means they only flow for a short period and then only in really good rainy seasons. It is said a portion of the Auob flows every 11 years or so and the Nossob perhaps twice every 100 years, in fact the Nossob last flowed in 1963, and the Auob in 1973,1974 and again 2000.) 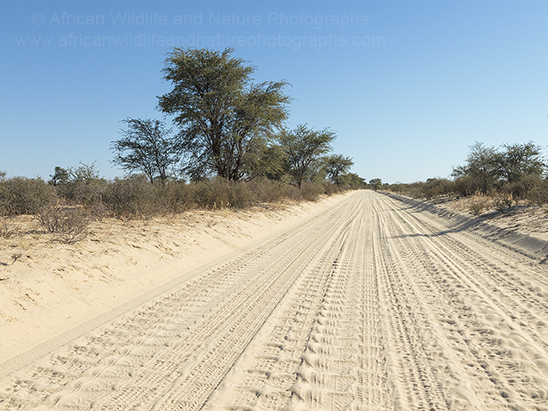 These dry riverbeds are the main ‘arteries’ up through the park and this is what you drive on, a dry soft sandy river bed, ideally to be driven by a 4×4 vehicle and for me this type of vehicle is a must for anybody travelling in Africa. With a speed limit of no more than 40 km hr (25 miles hr) we were to experience something new for the first portion of our trip, we had to travel up the dry Auob riverbed. So after that first 30 minutes we dropped down into the 'Auob' river bed with white soft and rutted sand, things slowed down dramatically. herds of Gemsbok (Oryx gazella) roamed the river bed on both sides, Red Hartebeest (Alcelaphus caama) were also evident in great numbers. as well as Springbok (Antidorcas marsupialis) The ever present ‘Pale Chanting Goshawk’ (Melierax canorus) seemed to be regularly perched on the vast amount of grey ‘Camel Thorn’ tree’s which lined our route as they surveyed their territories. It was difficult to drive and take in everything as the car always wanted to go in a different direction than you but we still managed to make good time, we had done our research and knew that we were to look out for the waterholes with the names 13th Borehole and 14th Borehole, Dalkeith and Craig Lockhart these were good productive boreholes for birds and large mammals and 'markers' along the route. The sun was now getting lower in the sky and according to our map we should have already passed these waterholes but we hadn’t. It was about 4pm and no real landmark or signpost to see exactly where we were, the Kgalagadi Transfrontier Park and signposts were not as good as the Kruger National Park. We’d passed a few loop roads but hadn’t taken them as they were all 1km longer. Eventually we decided to take one and discovered we were already at the Dalkeith waterhole; at last we had some reference, which meant we had already passed the 13th and 14th boreholes some kilometres back. We couldn't stop for long at Dalkeith as we still had about 20km (12 miles) of sand road to drive until our final destination for the night, but made note to return in the morning. We managed to reach the last waterhole before the Kalahari Tented Camp by about 4-30 pm and so far we hadn’t taken any photographs. This waterhole was called ‘Sitsas’ and was about 5km (3 miles) from our camp. The late afternoon light was fantastic with soft shadows and a warm orange glow bathing everything in its light. We decided to stop at this waterhole for a little while to see what we could see. 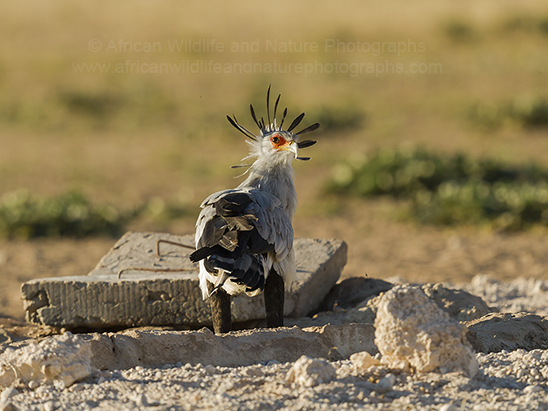 Sure enough within a few minutes four Secretarybirds (Sagittarius serpentarius) 'snake eating raptors' came to drink and delight us as they were really close, we were only 40 or 50 meters away from them. Four in one go, I hadn't seen four in total in the last four years and here they were altogether, the Kgalagadi Transfrontier Park had not disappointed us. However, we had to leave and head for camp, we arrived just after 5pm so we had plenty of time to spare but it was still 3.5 hrs to drive 120 km (75 miles). We managed to find our tent for our stay (Sparkes No. 10) 'fortunately' written in a book at the small reception area, as nobody was at the reception to greet us, we set off to find it ourselves. 'Kalahari Tented Camp' only has 15 tents, erected in a line, high up on the bank overlooking the ‘Auob’ and what a view over this dry riverbed we had, we also had a clear view to the ‘floodlit’ waterhole across the other side of the river. What makes these rustic camps so special is that they are un-fenced, which means that there is nothing stopping any of the wildlife from wandering around the camp but you need to be a little bit careful and sensible when staying at these camps just in case. We were shattered as we unloaded all our bags, boxes and equipment, the camp manager came shortly afterwards and introduced himself as ‘Jan’ and explained the rules about the permits to be signed in and out for each day. He took our permit and advised we could only take it from reception at 7-30am the following morning (just after first light). We had our ‘Sundowners’ (drinks to watch the sun go down) and plan for tomorrows outing, followed by dinner, a quick shower and to bed listening to the sounds of Black-backed Jackal (Canis mesomelas) howling just outside our tent and lions roaring in the not too far distance, We had made our first night in the Kgalagadi Transfrontier Park.